Aiken, SC then Tryon, NC then Minden, GER…3000 mi and 2500 photos later. the past two weeks have been a bit of a whirlwind. It began at Stable View Farm on Wednesday, August 9, where I shot the USEF dressage show in the rain. The rain was almost a relief from the 90+ degree temps we have been having here in SC. Stable View is probably the prettiest venue where I have taken photos. Highly recommend. Spent the following day riding and bathing Zoey, then churning through the 1100 photos from the previous day. Friday left my photos uploading and drove to Tryon International Equestrian Center with Zoey to show. Unloaded in the rain, but then the weather cleared up. Tryon is impeccable but ending up being a lot of walking for me. Our final opportunity to show before the National Championships in September, we decided to take advantage of the chance to show at the same venue. My tests went pretty well. We were more accurate but Zoey was not as forward as some of our other tests. I think sometimes I slow her down because it is more in my comfort zone. We got to do our freestyle again and improved our score to 72%! Music needs a bit of adjusting timing wise. Hopefully, I can get it right. Sunday I almost went off course in the individual test. Oops. I also have no pictures from the show, nor can I find an official photographer?! Sunday afternoon we packed up and headed home, because Monday I drove to Atlanta and flew to Hannover, Germany to the World Pony Driving Championships. Following a long car ride, even longer flight and a layover in Amsterdam, where I took a nap while hugging my backpack, I arrived in Minden, Germany. 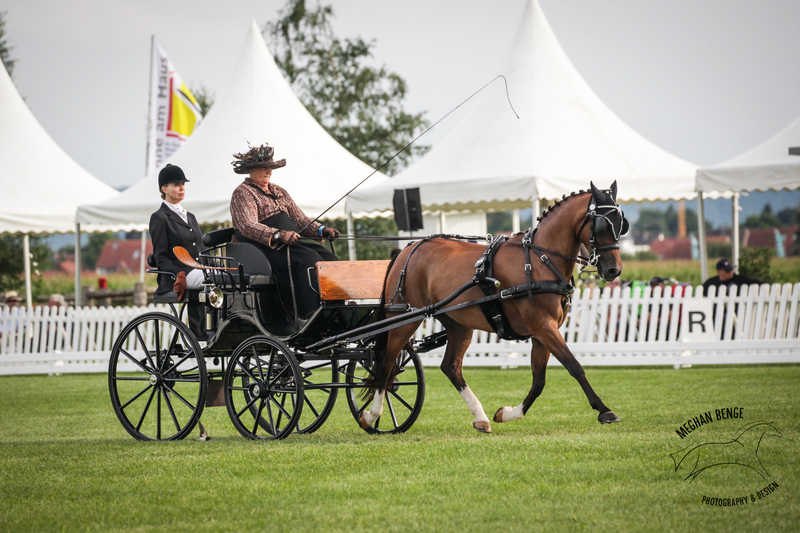 Minden holds a pony-only international driving show every year and this year was home to the World Championships. The show grounds were a total spectator’s dream, with the eight hazards on the edge of the field and the dressage/cones ring in the center. There were 99 entries, so had three days of dressage, the last person finished marathon around 6pm and cones did not finish until around 4 pm! I went to support Randy and her pony, Leyla. Leyla can be a very hot and tense pony, which can make dressage a challenge. They had one of the best dressage tests they have done all season. Was surprised she didn’t score better, but after it rained part of the day Friday, Randy decided it was better since the marathon starting order was the reverse order of placing. So she would have better footing earlier in the day. 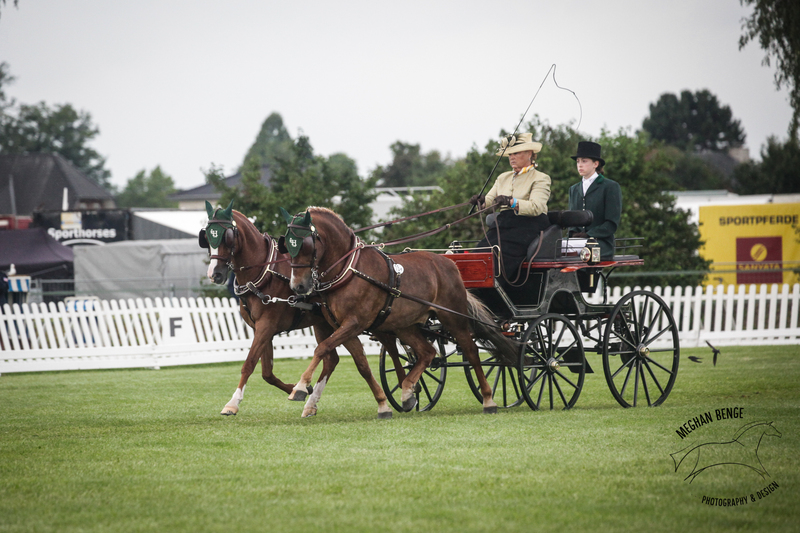 The other American entries both placed in the top ten in dressage. Yeah USA! I have to admit here though, that I didn’t understand some of the dressage scores. Some of the ones I thought should be penalized for rhythm problems weren’t. Others that I thought did very nice tests did not score as well. There were no dressage scores below 50 in the single ponies, which I found very surprising. Not sure what to think about this. They had the prize giving for dressage at the statue of Kaiser Wilhelm. Google Maps tools us up a dirt path to a fallen over tree, causing us to have to back down a large hill, were totally late and I ended up staying at the car as it was about half a mile walk from the parking lot. Never a dull moment! Leyla went all beast mode. Marathon day was sunny and cool. There were so many spectators! We would never even come close here in the States. Unfortunately, Randy rolled over in the seventh hazard. Pony is fine, Randy is pretty banged up. You could get so close to the hazards here, I almost needed my wide angle lens. I got some neat pictures of the pony teams toward the end of the day. 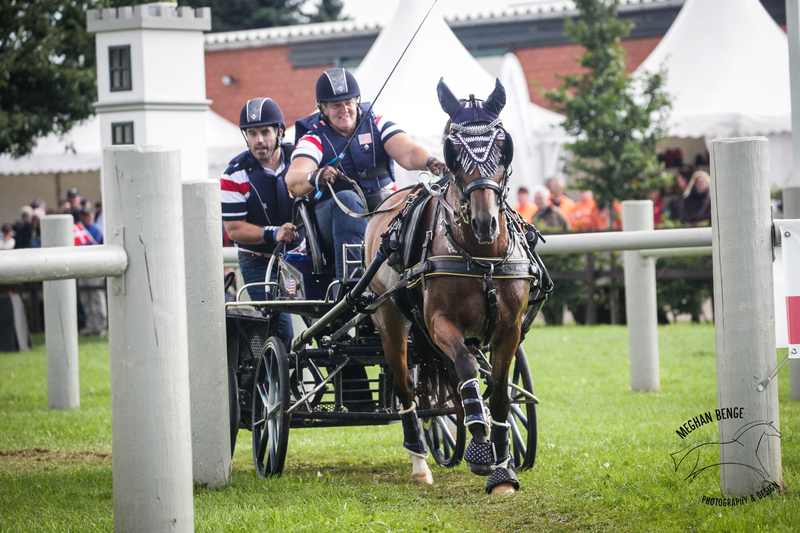 The pony teams in Europe are so fun to watch, the drivers favor Section A Welsh ponies, many around 12 hands. In spite of being tiny, they move like a million bucks and go crazy fast in the marathon. Overnight, Randy’s adrenaline must have worn off, because she decided she was way too sore to drive cones. It was a very twisty course and while the time was not impossible, proved to be very decisive for the pairs and teams. The single ponies had a handful of double clear rounds, but only a couple for the pairs and one in the teams. I like these kind of courses because it still gives you the opportunity to move up (or down) on the final day. Jan de Boer climbed his way back into an individual medal in cones. 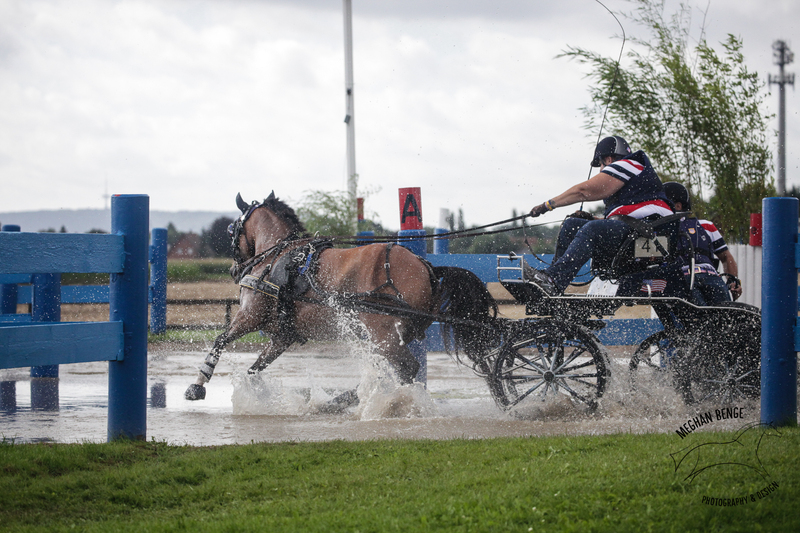 American Tracey Morgan drove double clear in the singles and ended up 16th overall. Katie Whaley had a few time penalties to hang on the 9th overall. It was fun to watch the pairs as the medal standings completely changed with the bronze medal going to a driver who was seventh or eighth going into cones. Made it home Monday, just in time for the eclipse, although I did not get any photos. It was a neat experience.